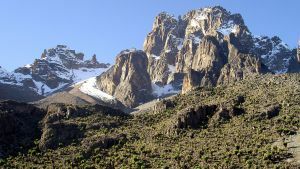 The Naro moru gate of mount Kenya is one of the many entry points into the national park as well as the starting point of the Naro moru trekking route to the peak. It is also the location of the Kenya wildlife services headquarter for the park (actual one being in Nairobi). As the Naro moru route is one of the most frequented on the mountain, the gates compound is one of the most built up on the whole park, sporting a cottage for accommodation that previously used to be home to the senior park wardens until 1988 . This has two bedrooms, a bathroom, a kitchen, hot water and a living area with veranda and log fire and is available to all at a fee (pre booking required). Apart form that, the gate has an airstrip, a short distance north west of it, for ease of access by plane from any of the country's major airports. 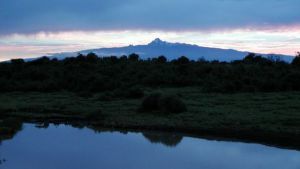 The Naro moru gate is located in Nyeri county, at the foot of mount Kenya, just a short distance from the park's boundary and the edge of the rainforest. Less than ten kilometres west of it is the small town of Naro moru, that holds several hotels and restaurants. The gate's surroundings are filled with trees, teaming with sounds of nature - birds, insects and all, with rainfall being higher than in areas outside the park. At the time of writing, there is a well maintained gravel road from the town all the way to the gate. 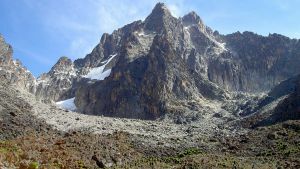 When trekking up the mountain, the next point is the met station campsite (a 4 hour trek) where there is a meteorological station, log cabins - courtesy of the Naro moru river lodge as well as space for camping. Are you associated with Naro Moru gate? Contact us to improve this page or create another page for your business.